January 24, 1981. At last! I’ve gone to my first Voodoo [sic] ceremony….I met Frisner and Ken in the building Frisner used to live in in Manhattan….Ken had a pair of claves for me to use during the ceremony. I was to beat the bell pattern to any songs that I knew the bell part for. We got into Frisner’s car and drove up to the Bronx. February 14, 1981. I went to two ceremonies tonight. The first was in a Brooklyn basement, and I went with Frisner and Bonnie. It was quiet, partly because they didn’t want drumming. Apparently they’d consulted a spirit about this….The second was actually in a Manhattan apartment! On West 98 Street….During one of the songs, a spirit came down—practically in my lap. I got a good whack across the bridge of my nose, and Frisner’s drumming was interrupted when the guy fell over on the drum. My tape recorder slid off my lap, but I quickly rescued it. No harm done. I have a nice tape now, and my nose doesn’t seem to be broken. My student notes from 1981, quoted above, recount Vodou dances in three different boroughs within three weeks. With the possible exception of Staten Island, where few if any Haitians lived in the migration’s early days, you could find Vodou houses anywhere, and especially in certain neighborhoods of Brooklyn, Queens, and Manhattan. But Haitian Vodou always seemed most at home in the People’s Republic of Brooklyn. As an adopted child of the culture, I grew up in Vodou Bouklin, and one of my favorite houses thrived only a block away from home, on East 95th Street between Rutland Road and Winthrop Street in East Flatbush. For many of us, Kay Nelly (Nelly’s House) held first place throughout the 1980s. Nelly was mother of a lively Vodou society. Her several sons were married with children, and most lived in the apartment building on East 95th. The landlord gave Nelly access to the basement, and whenever the manbo (priestess) held a dance, the whole neighborhood packed the place—enough to chase away a well-known researcher when he tried to document a dance there. 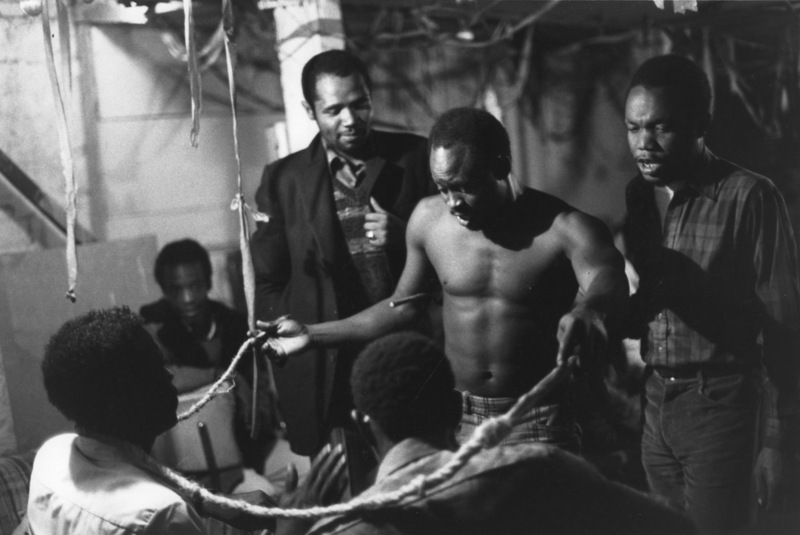 Our featured video, shot on May 20, 1989, captures members of Troupe Makandal (drummers Frisner Augustin, Steve Deats, Luc Richard, Jean Robert Morisseau, Anthony Cyprien, and Jean Paul Joseph, and singer Jocelyne Louis); Nelly and family; and active Vodouists from the community. The dance served a double function: (1) a man married the two Èzili in an exchange of special devotion for spiritual support, and (2) the society celebrated the spirits of the earth, as per custom in the month of May. Note the entrance of the sweet and flirtatious Èzili Freda Dawomen (1 min, 35 sec) dressed in pink, kissing the men she passes while holding her groom-to-be captive at the same time. Compare that with the entrance of the tempestuous Èzili Dantò dressed in red (2 min, 20 sec), a fighting spirit carrying a dagger. That’s Nelly herself at 2 min, 17 sec, dressed in white and ushering the spirit in with a spray of liquor. Both spirits were in possession of devotees. Note, too, baskets bearing fruits of the earth on the heads of servants as they sing to the earth spirits (3:20). Finally, don’t miss the children, especially the smart little boy who picked up so quickly from Frisner on the bell part (4 min, 25 sec). The presence of children in Kay Nelly made her house one of the closest to Haiti in New York. Haitian Vodou in New York City still needs its historian. Although no longer a new phenomenon in 2015, it lacks a comprehensive study for students, scholars, and other enthusiasts of the future. Given the prominence of music in Vodou rites, music would occupy a significant space in that study, with Frisner Augustin a leading player. I’m not stretching the truth when I say that Frisner played a prominent part in creating a history of Haitian Vodou in New York. Many have noted his role as cultural ambassador on stage, but he actively shaped the story of Vodou in the boroughs’ temples as well. The Frisner Augustin Memorial Archive wants to write that history. While celebrating the life of an individual, it also documents the evolution of a culture and its arts. Please help us move this project forward with a tax-deductible contribution. Thank you! Photo by Chantal Regnault (third paragraph): Frisner plays lead drum in a Brooklyn basement while Gesner Désir accompanies on bell, 1984. 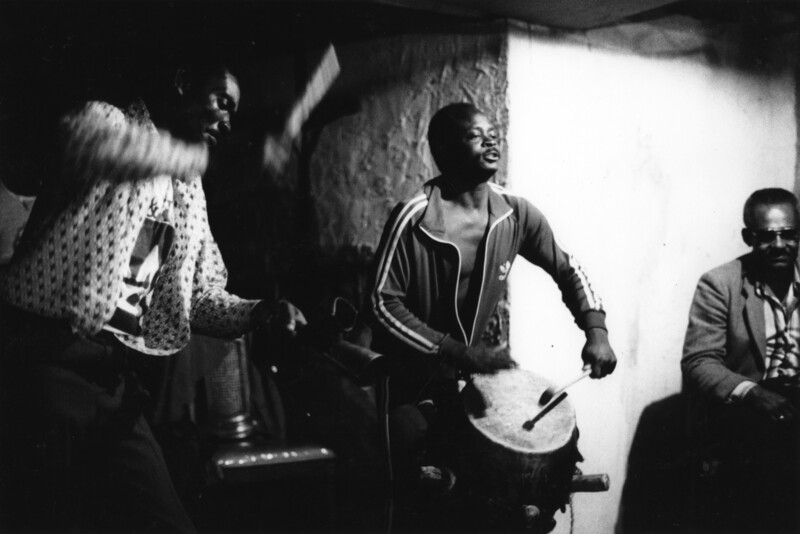 Photo by Chantal Regnault (sixth paragraph): Frisner sings and interacts with fellow drummers at a Vodou dance in a Brooklyn basement, 1984.